Yellow is the colour of sunshine, Spring and Summer. Yellow means hope and happiness and buttercups and a host of golden daffodils. Yellow is egg yolks on a winter morn, new ideas at dawn. Yellow is the great communicator and loves to talk. Yellow is the color of the networker and the journalist. Yellow is the scientist; methodical and decisive. And YELLOW is the April theme/prompt for The Collage Club. I had lots of cuttings and ideas when I first sat down to make this collage, but somehow I couldn't bring them all together in a cohesive image. Today was the day. A golden beam of sunshine helped. It ended up about photography, specifically that of models for portrait shots, 'Empire Studios' touting for business, the camera finding little jewels of light, the magic in the moment, and yet does it ever really capture the truth of beauty or the beauty of truth? 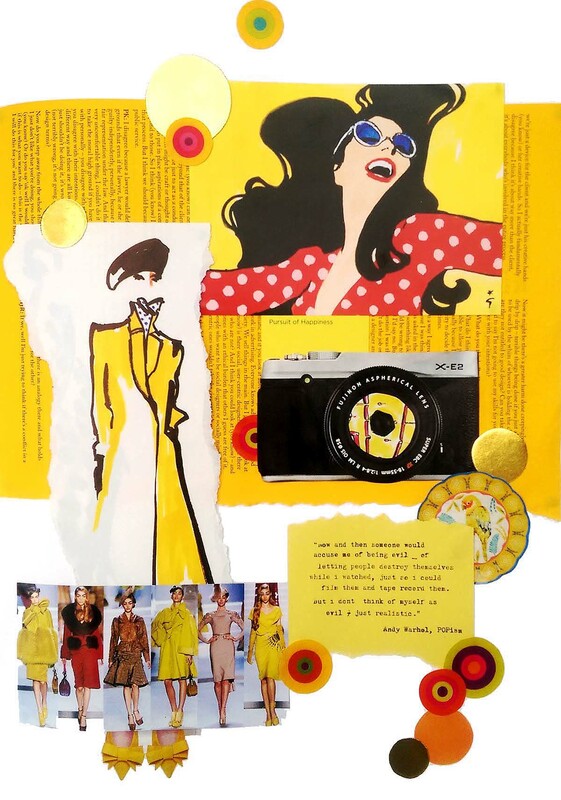 My second collage for YELLOW is again inspired by fashion, by models on the catwalk and the glamour of it all. It's all a 'Pursuit of Happiness' - of looking good, finding the right angle, the perfect smile, of inspiring emulation and adoration. Yet all the striving turns the final 'model shot' into a falsehood, the flash of the camera projecting an unreality. Models have freely admitted 'they couldn't look as good as themselves' in their off-catwalk life, without make-up artists, hairdressers, airbrushing, photoshopping, primping, preening. Now and then someone would accuse me of being evil - of letting people destroy themselves while I watched, just so I could film them and tape record them. But I don't think of myself as evil, just realistic." POP goes the weasel. That's a wrap. Who knew yellow could get so dark? 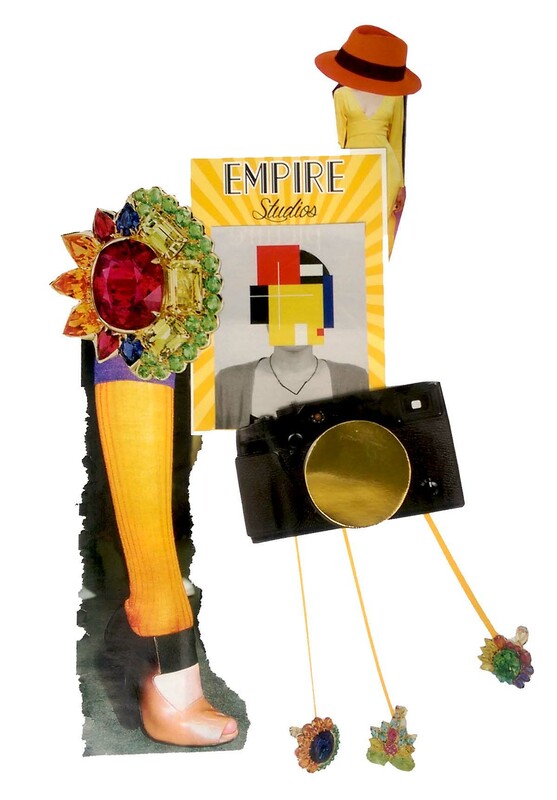 Check out last month's collages on the theme of URBAN.